The Most Amazing streets are some of the most magnificent boulevards and avenues on the planet. The Russian Federal Highway connects Moscow to Yakutsk where the coldest temperature ever recorded outside Antarctica was recorded. Yakutsk is also the largest city built on continuous permafrost. Most houses are built on concrete piles because of the frozen ground. What does all this have to do with being one of the worlds most dangerous roads? Well during the winter which is approximately ten months long driving in and out of Yakutsk is subject to heavy snow ice and reduced visibility. However winter road conditions are a picnic compared to trying to navigate the Russian Federal Highway on July and August. 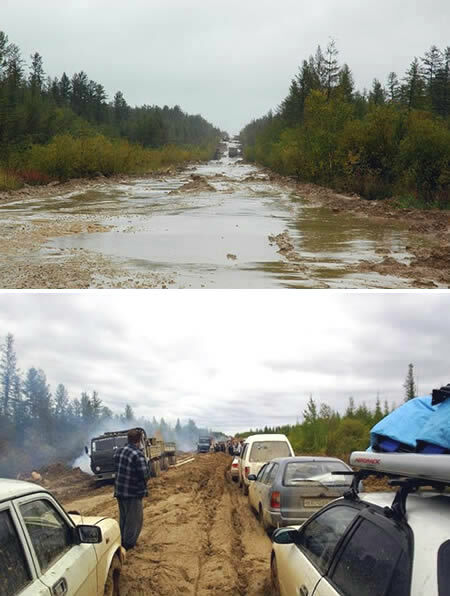 Though many Siberian residents will tell you the highway is not paved to keep the Germans out (a tired World War II era joke) the truth is because of the permafrost there is no asphalt creating a mud induced traffic jam every time the summer rains swing Yakutsks way. Near thousand car traffic jams are not unheard of and during these back ups and travelers might pass the time while stuck in Siberian traffic by looting beating and kidnapping other travelers. Siberian mud pirates.